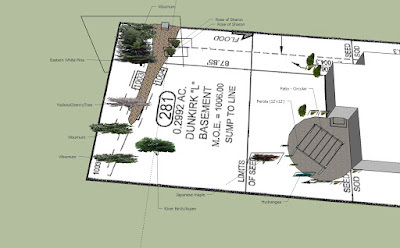 Dunkirk Disambiguation:Building Our Ryan Homes Dunkirk: Patio! Patio! Patio! It's finally time! Tomorrow starts the next major we've had on our to-do list since we moved in over two years ago - a patio! The crew from Pavers by Design will start work on our 27th (and final) revision of our plan for something in our back yard. It's been quite an ordeal. We wanted an open, unobstructed gateway to the yard, without railings, drop-offs or anything that would impede the flow of traffic. I'm not sure why having a catwalk extending into the yard was our initial plan, but there it was. The problem with a deck was that in order for it to fit our primary requirement of minimal maintenance, it would have to be made of some kind of composite material - we didn't want wood we'd have to stain every year or two. Yes, we are just that lazy. Another problem is that our final grade meant the primary level of the deck would only be about 14 inches off the ground. It seemed a little ridiculous to build a deck that was going to be that close the ground. Those concerns pushed us to consider a patio. And so we did. I sketched up many variations, some curvy, some rectangular - just about every shape you could image. However, the size of iteration kept increasing - and then we started thinking about materials. Stamped concrete was our first choice - maybe something that resembled wood. By now we were up to around 1,000 square feet - and we weren't prepared for the cost. So we started redesigning and shrinking our plans. But we still had an issue. Due to all of the construction, getting someone to 1) give us an estimate and 2) actually schedule the work, proved to be more challenging that we expected. Concrete contractors seem to only do these projects on the side and really prefer to do foundations and driveways. At this point, we'd pretty much given up on a patio for the near future and resigned ourselves to living with the pea gravel we'd put down to cover up the mud for a few more years. It's not huge, but it should provide us with something better than pea gravel, which is sure to disappoint the cats who have spent many a night playing with the small stones that inevitably found they're way into the house. We wound up a little under 500 square feet, but we figure it can easily be expanded if our wants and means change in the future. The pavers we chose are from Cambridge, part of their Sherwood Collection - the Ledgestone 3 Pc. 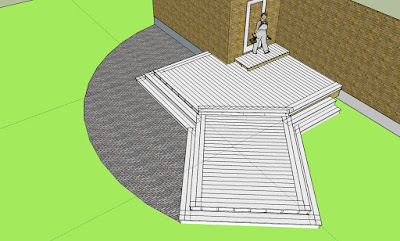 Design Kit in Sandstone.